I recently found a picture in one of the old photo books at Deke Ehr's Old China Hand bookstore on Shaoxing Road. It represented a deep-blue-eyed Englishman wearing a Turkish fez on his head with the mysterious title "Gordon Pasha". I probably stayed five minutes contemplating this fascinating face, puzzled by the association between the oriental type of his clothes and honorific title and the English spelling of his name as well as his staring at the camera. 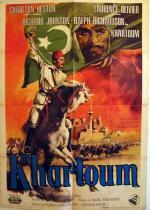 This is not the first time I hear the Turkish title of "Pasha" applied to a Western figure. When I was young I indeed used to watch a Franco-German TV series called ”Omar Pasha” (Click to watch). It narated the adventures of a Serbian origin former officer in the Austrian army who converted to Islam and became one of the most talented generals in the whole Ottoman Empire. 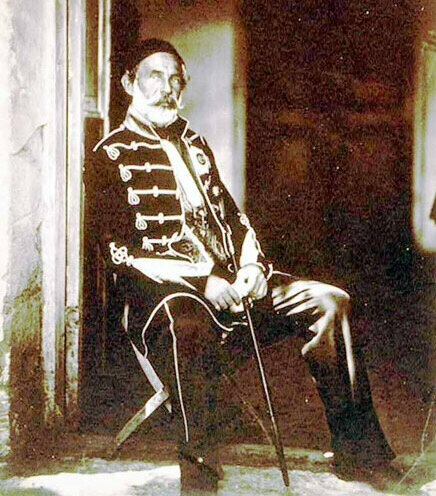 This fiction was inspired by a real character called Michael Latas (photo below) who lived between 1806 and 1871 and eventually became the governor of Libanon, Bagdad and later the Minister of War of the Sultan. So this name of Gordon Pasha intrigued me to the point that I decided to know more about this charismatic figure. It eventually revealed to be closely connected to Shanghai history, to my surprise! Charles Georges Gordon actually was born in London in 1833. After serving in the Crimean war against the Russian Empire in 1855, he was eventually granted the title of Chevalier of the Legion of Honnor by the French who became impressed by this daring participation in the siege of Sevastopol. Back then, he already made a reputation of being brave and capable. The French used to say said about him: "If you want to know what the Russians are up to, send for Charlie Gordon." Strange enough, I discover that the Omar Pasha from my child memory also fought during the same Crimean war against the Russians. This is five years later however that Charles Gordon will achieve his most decisive military success and this will happen in Chinese Shanghai! Gordon was dying for action, so he made several requests to the British Ministry of War, and was finally sent to China in 1860 to fight the Taiping rebellion. At that time, the charismatic madman called Hong Xiuquan, pretending himself the brother of Jesus, had declared war on the Qing Emperors, raising an army of 500 000 men. Those rebels had already conquered almost the whole of South East China, which were the richest regions. Massacres and destructions had reached a level which was hardly bearable for both population and existing authorities. In Shanghai, the foreign settlements were under threat, so the British and French decided to support the Qing Dynasty in fighting the rebels. In this unforeseen collaboration between the Chinese and the Westerners, the American mercenary Frederick Ward led the Chinese troops into battle. 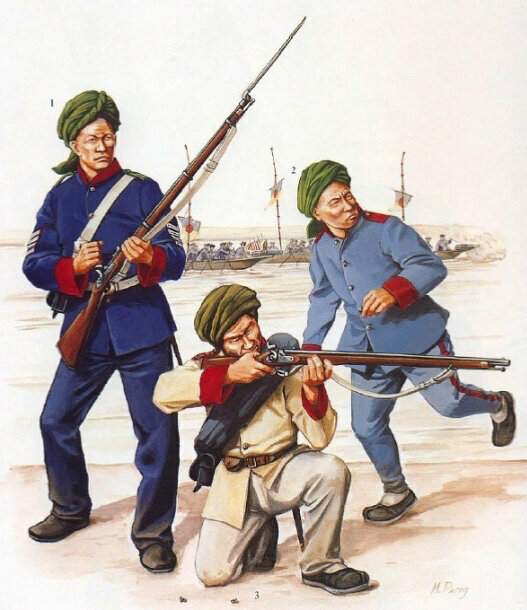 Bringing western military skills as well as modern equipments, Ward successfully contained the rebels with help of his militia which became "the ever victorious army". He got killed in 1862 after ensuring the victory in the battle of Cixi. Ward's successor, an American called Burgevine, was disliked by the Emperor for his heavy drinking, racism and extreme greediness. The name of Gordon was proposed, as he had a reputation for being honest and incorruptible, qualities that hardly applied to the Chinese officers themselves. 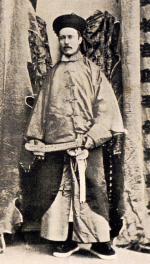 In his command of the Ever Victorious Army, for which he designed the uniforms (photo above), "Chinese Gordon", as he would soon be called by his compatriots, brought discipline, even ordering summary executions for soldiers who sold themselves to the Taiping. He eventually regained the important cities of Kunshan and Suzhou, leading to the fall of the Taiping in 1864. He made friend with Li Hongzhang who later became the powerful Minister of Industry and Communication and early moderniser of Imperial China. 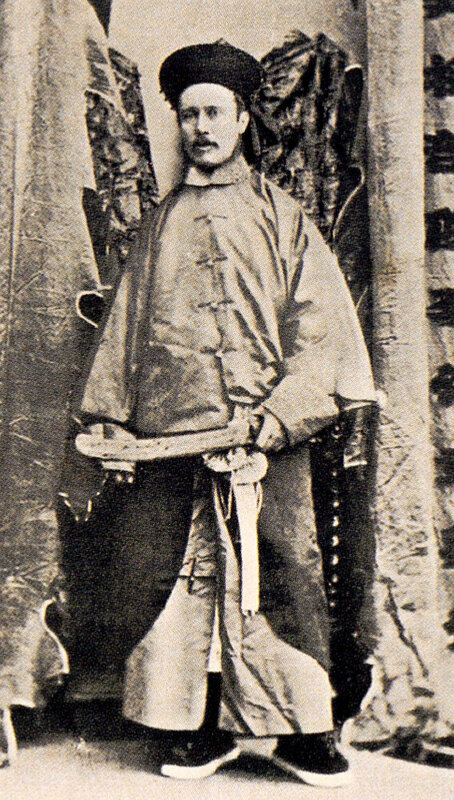 For his outstanding contribution to the rescue of the Qing Empire, Gordon was awarded with the title of tidu (提督), the equivalent of field marshall, and received the "imperial yellow jacket" (photo). After the Chinese episode, Charles Gordon returned to England where he devoted himself to charity work as well as religious quest for a couple of years, showing another aspect of his personality. In 1874 he accidentally met with Egyptian Prime Minister in Constantinople who proposed him to serve under the Khedive (viceroy in the Ottoman Empire) of Egypt. At that time, this part of the Ottoman Empire was deeply influenced by Europe as the Canal of Suez had been recently opened (1869) and the viceroy himself was French educated. Although a devoted Muslim, he was said to like Italian and French wines, imposed French language at his court and tried to modernize his country on the model of Europe. After negotiations, the British officer was eventually appointed governor of a South Egypt province called "Equatoria" which included today's South Sudan and the Great Lakes region near North Uganda. In his mission, Gordon quickly made ennemies when fighting the slave trade in the region, as this was profiting to local officials. 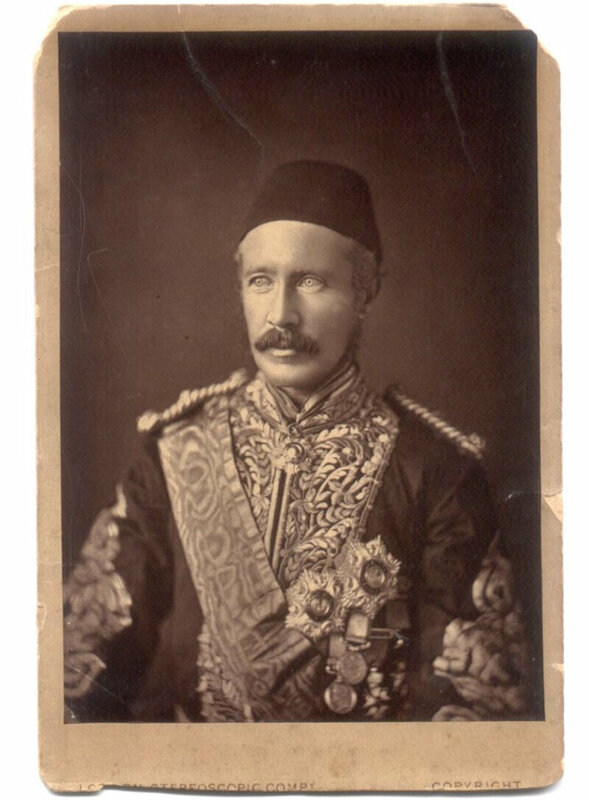 In 1876, the Khedive made him Governor-General of the entire Sudan with the honorific rank of a "pasha" in the Ottoman aristocracy. In this position, he deeply reformed the local cruel ottoman laws, abolishing torture as well as public floggings. However his efforts to fight corruption remained fruitless and the power of slave traders became even stronger after 1876 when the Egyptian economic crisis made financing of his reforms more difficult. This led a deeply depressed Gordon to return to England in 1879. 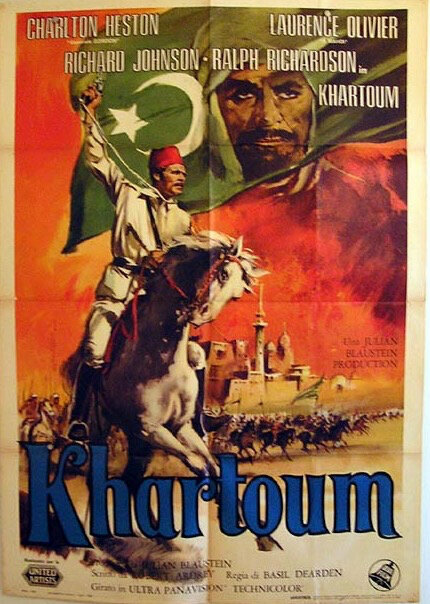 The last episode of the life of Gordon is probably better known as it is depicted in the 1966 movie "Khartoum" with Charlton Heston (above) and also immortalized in Victorian painter George William Joy's "Gordon last stand" (nearby). 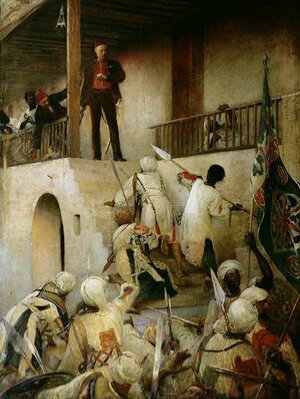 Gordon was called back to Sudan in 1884. At that time, the Egyptian government was facing a military coup in Cairo and the British had increased their influence in the Suez Canal region. The remote conquests of the Khadive became of smaller interest. This was precisely the moment chosen by the Dervishes of the "Mahdi" to launch an Islamic revolt. The Gordon of those years, however, was not the same man anymore according to many witnesses. He had become erratic and unpredictable. So, his decision to hold Khartoum against received order to evacuate the city is often commented as an unconscious act of suicide. He would eventually die on 26th January 1885, in arms, contradicting the version given by the press of the time of a defenseless martyr, a sort of Christ sacrificing for men's sins. This allegory is even strengthened in both painting and movie showing a Muslim throwing his spear, just like the Roman soldier at the dying Christ! Chinese Gordon, Gordon Pasha or Gordon of Khartoum as you prefer is just another amazing Shanghai character who embodied the synthesis between East and West. His multiple personality as a man of faith fighting for social justice and a military leader at the same time even added to the legend.